A wind generator is a mechanical device that generates electrical energy from wind power. Wind turbine generators are a little different to other generating units you will find attached to the electricity grid. The reason is that the generator has to work with a power source (the wind turbine rotor) which supplies greatly fluctuating mechanical power. 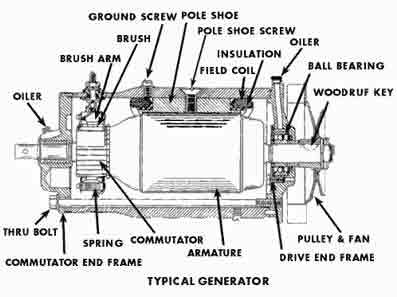 The image above shows a typical generator and its components. The two main parts of a generator can be described in either mechanical or electrical terms. The rotor; is the rotating part of a generator. The stator; is the stationary part of a generator. Armature; is the power-producing component of a generator. The armature windings generate the electrical current. The armature can be on either the rotor or the stator. Field; is the magnetic field component of a generator. It is provided by either electromagnets or permanent magnets mounted on either the rotor or the stator. Generators need to be cooled as they work. Most wind turbines enclose the generator in a duct and use a large fan to cool them. There are also water cooled generators. Water cooled generators are usually compact, which gives them some electrical efficiency advantages, however they require a radiator in the nacelle to get rid of the heat from the liquid cooling system.